Boaters heading out on winter cruises off Southern California have been treated to some of the best whale-watching conditions of the past 10 years, with gray whales migrating south in record numbers and killer whales — or orcas — making sporadic showings, as well. Whale-watching charter vessels from San Diego to Santa Barbara have reported multiple gray and finback whale sightings, and large pods of orcas have been appearing right alongside boats, in some cases. “There haven’t been many days lately where we haven’t seen a whale,” said Dan Johnson of Dana Wharf whale watching tours. Johnson, who spent 16 years as a deckhand on charter boats operating out of Dana Point Harbor, said that the past year has been stellar for whale watchers. “Last year, we had all of those blue whale sightings from May through October, and then the gray whales came along a little earlier in their migration than usual,” Johnson said. Not only did the whales arrive earlier, but they came in much higher numbers than usual, according to Alisa Schulman-Janiger of the American Cetacean Society. Janiger oversees the gray whale census and behavior project at the Los Angeles branch of the American Cetacean Society, where — since 1979 — designated spotters have located and recorded whale activity off Palos Verdes Peninsula from their deck at the Point Vicente Interpretive Center. Each winter, gray whales migrate south along the coast from the frigid waters of Alaska to nursery grounds off Baja California, where pregnant females give birth to a new generation of whales. In December, when southbound whale sightings usually start picking up, 198 gray whales were spotted — nearly triple the normal sightings, according to the survey’s 10-year average. While the increase in whale activity has whale lovers overjoyed, scientists are wondering what, exactly, is causing the influx in numbers. Biologist Wayne Perryman of the National Marine Fisheries Service has a hunch about why the numbers are increasing: Two good feeding seasons in a row in Arctic waters could be resulting in a larger number of pregnant whales coming south to give birth, along with an increase in fattened-up females coming south, ready to get pregnant for next year (as gray whales often breed on the southward migration). Perryman, who conducts the U.S. government’s official gray whale cow and calf census, believes this could be a banner year for gray whale calves. Coming out of La Jolla, he has been tracking the whales from the air — flying along the coast using a system of cameras mounted on a National Oceanographic and Atmospheric Administration plane to capture images of migrating grays. The data will help Perryman discover any changes to the whales, in terms of size and shape, that may be the result of climate change. In addition, Perryman will be able to spot pregnant whales and formulate data on the overall health of the California gray whale species, which he has estimated to be around 20,000 in total. Starting early this month, the gray whales will begin heading back north to the feeding grounds with their newborn calves, giving boaters and other whale watchers another opportunity to point and marvel. However, the migration also gives orcas a chance to feed on some of those calves. Orcas, which have rightfully earned the name “killer whales,” have been known to prey on newborn calves as they begin the long migration north. While usually remaining north of Monterey, some families of orcas have begun moving south along the Los Angeles County and Orange County coast. 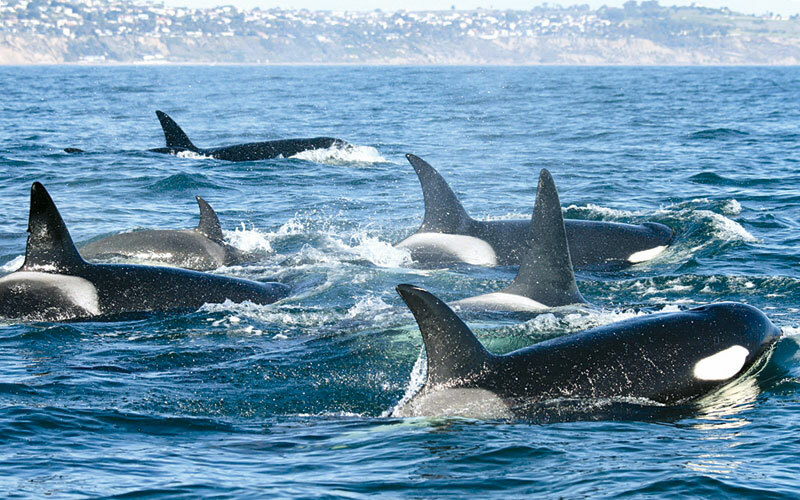 One orca family known as CA51 (the whale groups are numbered from 1 to more than 200), was first seen off California in 1991 and has become known as the “transient” pod, ranging up and down the coast. The seven-member family — which consists of the mother, four offspring and two calves belonging to one of the daughters — usually stays around Monterey Bay, but it has been known to take detours south. It was spotted off Malibu in 2007 and 2008, and it was sighted multiple times in 2010. This season, the CA51 group has made many appearances in Southern California since December — showing up off Ventura, Newport Beach, Dana Point and Palos Verdes, sometimes with other orca family groups. “They are my favorite group of transients,” Janiger said, who also heads up the California Killer Whale Project. She categorizes orca activity and reports on individual markings of the whales, for identification purposes. Janiger said the group is unusually friendly to boat traffic. When the whales are not actively feeding, they will come right up to vessels, sticking their heads out of the water. For boaters looking to capture photos or video of the migrating giants, Janiger stressed the importance of keeping a safe distance from the whales — at least 100 feet. She added that boaters should never cut in front of — or separate — groups of whales.